The westernmost capital of mainland Europe occupies a stunning position on the Atlantic coast where the Tagus river empties into the Atlantic Ocean. While the population of Lisbon proper is a little over half a million people, the Lisbon Metropolitan Area is composed of 2.8 million people. Lisbon is a very walkable city. Influenced by the Gulf stream, Lisbon has one of the mildest climates of western Europe. Winter and early spring offers the most rain, but it snows only infrequently in Lisbon and freezing temperatures are rarely felt. Mist off the Atlantic sometimes makes Lisbon feel cooler than inland Portugal. For Lisbon historic temperatures and rainfall, as well as current weather conditions, see Lisbon, Portugal Weather. Lisbon Portela Airport is located 7km north of the city of Lisbon. There are two taxi stands at the single airport terminal, outside Departures and Arrivals. The new extension of the Red line connects the international airport to the Lisbon metro system. See the metro map. ScottUrb provides transport to the airport from the Estoril and Cascais area. Buses operate every day and leave every hour from ​07:00am to 10:30pm. Lisbon has several railway stations: Santa Apolónia and the Gare do Oriente are the major ones. All offer access to the city center via public transport or are within walking distance. There is a good tourism office located at the Arrivals hall of Lisbon Airport. If you don't have a hotel reservation when you arrive, this is the place to get your map and make lodging plans. Other offices are located at Apolónia rail station, Mosteiro Jerónimos in Belém. There is a kiosk n the heart of the city in old quarter of Baixa, that will answer all your questions as you walk around in this fascinating city. The main Lisboa Ask Me Centre is in the Placa do Comércio. The Lisbon Tourism web site is Visit Lisboa. Hotels in Lisbon cost less than in most other capitals of Western Europe. This makes Lisbon a great place to splurge on a level of luxury you can't normally afford. I've had great stays at the five star Dom Pedro and the Lapa Palace. The Bairro Alto Hotel is a favorite with visiting Americans. Even if you're not staying there, its panoramic terrace is a fine place to have a drink in the afternoon or evening. If you need an apartment in Lisbon, HomeAway lists almost 1000 vacation rentals in Lisbon district. 7 Colinas - one card gets you on pretty much every transport system in Lisbon. The rechargeable card has an antenna that you hold near a reader found on Carris buses and trams and at the underground to allow admittance. It's rechargeable, and a great value for transportation in Lisbon. The new Navegante Pass offers full mobility throughout the city of Lisbon by integrating the public transport companies Carris, Metro and CP in the city's urban circuits. One of the most compelling day trips from Lisbon is to Sintra, a 45 minute train ride away and a world apart, full of (real) fantasy castles and villas. While the trip to Sintra is very easy to do on its own, you might want to consider a Viator day trip from Lisbon tour (book direct). 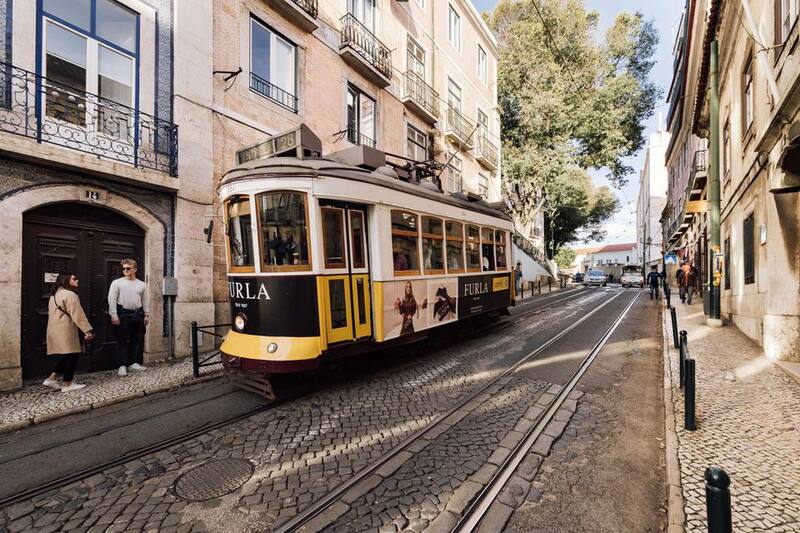 The seven hills of Lisbon are loaded with things to do. The alfama district near the Targus has escaped many of the earthquakes that have ravaged Lisbon, and you can walk through the narrow lanes and enjoy the old village atmosphere of Lisbon. Nearby is the Fado Museum, a must for music lovers. Santa Maria Maior de Lisboa or Sé de Lisboa is Lisbon's cathedral and the oldest church in the city. It's been rebuilt many times after various earthquakes, and has a jumble of architectural styles. Construction started on it in 1147. Get great views of Lisbon from the Castle of São Jorge on the city's highest hill. Take the #15 tram from Comercio square out to the Belem district, where you'll likely spend all day seeing the Mosteiro dos Jeronimos (see Mosteiro dos Jeronimos pictures), visiting the Belem Tower (Belem pictures), or Terre de Belem, and the Padrao dos Descobrimentos (discoveries monument), with time out for a Pasteis de Belem, the famous custard tarts of Lisbon. Have lunch at A Comenda Restaurant inside the Belem Cultural Center. If you have time left over, take the #28 bus from in front of the Monastery to Postela and visit the Parque das Macoes, built for Expo98, and see the Oceanarium, one of the biggest aquarium displays in Europe. For shopping and nightlife, the Bairro Alto is the place to be. Nearby is the Elevador de Santa Justa or Santa Justa lift, where you can not only see Lisbon from above and visit the Convento do Carmo, an earthquake-ruined Carmelite Convent that stands as a sort of symbol of Lisbon, but you can buy transportation tickets good for all forms of public transport at the base of the Elevador, including the 7 Colinas pass mentioned above. Estação do Oriente, Orient Station, besides being a major transportation hub, is a beautiful iron and glass structure particularly evocative at night. We've enjoyed the Restaurante A Charcutaria, which specializes in the food of the Alentejo region of Portugal. A hot, new restaurant offers up some fine, up and coming wines from Portugal, Enoteca de Belém. If you want a well-received restaurant or bar connected with a state-funded circus school, try Restô do Chapitô, or read Clowning Around in Lisbon for some background info. For a virtual tour of Lisbon, see our Lisbon Pictures.